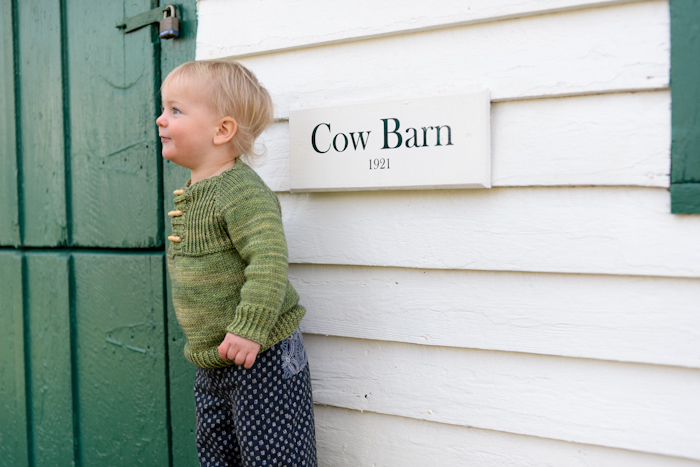 There aren’t nearly enough nice little boy sweater patterns out there, and I was excited when I came across this one. I wanted a pullover for Silas, with a little something extra to make it special. 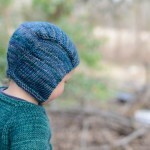 The name of this pattern is Kinsale, and my Ravelry notes are here. I really love the twisted rib details, and also love the toggle buttons I used on the placket. The yarn is a worsted 80/10/10 blend from Sweet Basil, in the lemongrass colorway. This is the second sweater I’ve knit for Silas using this yarn (Ravelry notes for the other sweater here,) and I’ve found that not only is it really lovely to knit with, but it wears very well too. This little green sweater ended up causing me a good bit of angst, through no one’s fault. It just was what it was. I cast on for the size 18 months sweater, but ended up increasing for a couple extra rounds to the size 2 numbers, not thinking about the fact that I only had enough yarn per the pattern yardage requirements to knit the smaller size. I knit a few inches below the sleeves when I realized that I didn’t like the way the color was pooling. So, I ripped back to the armpits and began again, this time alternating skeins. About three inches down, I realized that I might run out of yarn. So, I stopped working on the body, knit the sleeves and placket, and then reevaluated the yarn situation. I ended up ripping back to the armpits yet again, decreased a couple stitches under both arms, and finished the body on Christmas Eve with just a few yards to spare. The whole thing sort of stressed me out, reminding me of the reasons why I try not knit for deadlines-specifically Christmas. But, once all the drama was past, I was so glad that I did decide to squeeze this sweater in for Silas to wear to Christmas Mass. I love everthing about the sweater, the varigated green, the pattern, but most of all, the adorable little guy inside of it. He is the sweetest, just want to snuggle him! I can’t believe how big he’s getting! And the sweater is gorgeous! 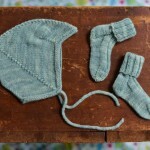 I hope to make a couple for Little Man this coming year that actually fit him (as opposed to my attempt that did not fit him, though it should have according to the Yarn Council’s measurements). So adorable! Both the sweater, and Silas – of course! Ugh. I bet it stressed you out. So worth the angst. Lovely little basil sweater. Really lovely, Ginny! Great work! Off to check out that pattern now! The sweater turned out great! Love the new header (especially the snowdrops!) 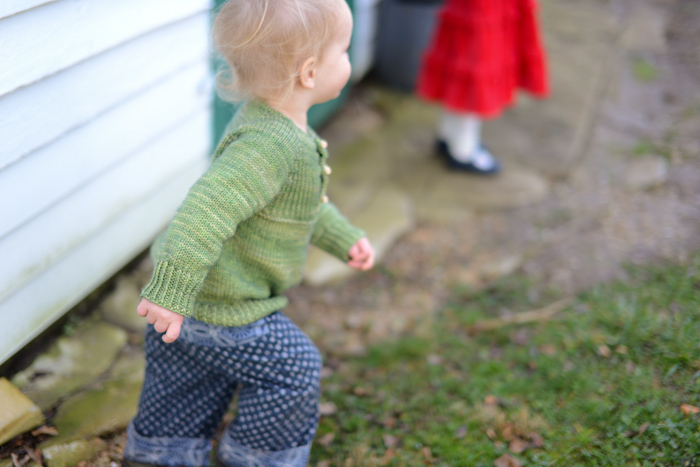 and the sweater is lovely, too…a very pretty color; I am partial to greens. A blessed Epiphany to you; hope the cold passes quickly! Too cute! I know what you mean about deadline knitting, though. The sweater is gorgeous, I LOVE the colour and the pattern is dear – but do you know what I love best? That round little tummy 🙂 He is delicious! Oh, I love it! 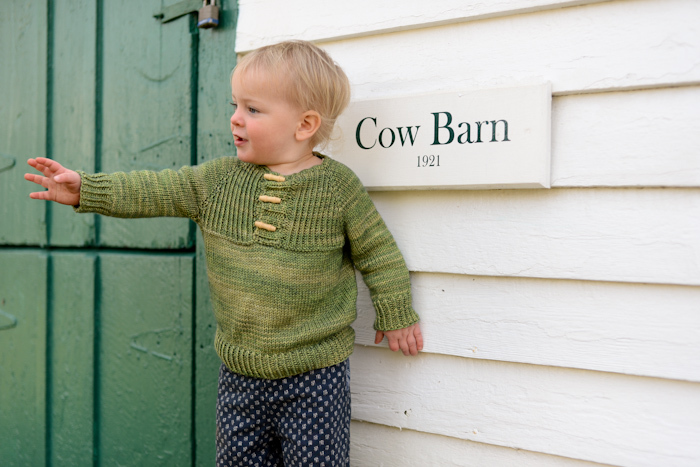 My son is just a few months younger than Silas and I’ve been wanting to knit him a sweater. I haven’t knit a top down sweater before, though! I have always been curious – how do you handle having so many wool items? Do you wash them all in batches? Or just hang them out? We have some wool pants for my son and I just hang them out when they get dirty – but one pair has food on it and I know I need to wash them but it just hasn’t happened, yet! 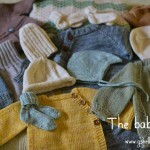 I couldn’t imagine with six kids and lots of wool clothes how you wash them all! I don’t have a system with woolens. Sometimes I throw quite a few things in to the washer and wash on wool setting and then hang to dry. Sometimes I spend time washing a bunch by hand in the bathtub. They get cleaner when I wash by hand, so I prefer that method. After washing, I wring them out gently and press them between towels before putting them on the rack to dry. I have a really large, sturdy drying rack so I can dry quite a few things at once. I will confess that I don’t wash all that often, so my kids sweaters get pretty dirty between washings! Thanks for the reply! 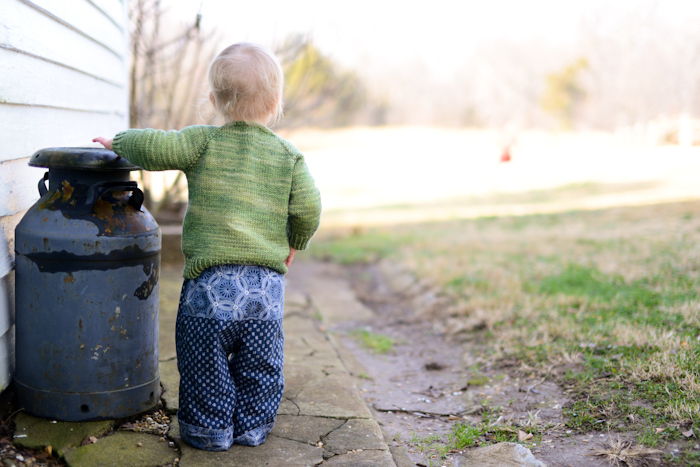 You inspired me to mend and wash my son’s wool pants. One pair was pretty dirty (had food crusties) but the other pair wasn’t too bad! Amazing how long wool will stay clean! Beautiful! And those pants…I’ve just made my first quick change trousers and am totally hooked at their cuteness! What a cute sweater! I love the toggle buttons! That sweater is absolutely beautiful, along with the little boy wearing it. I definitely agree about the lack of patterns for boys, even more so as they get to be around 5 and up. 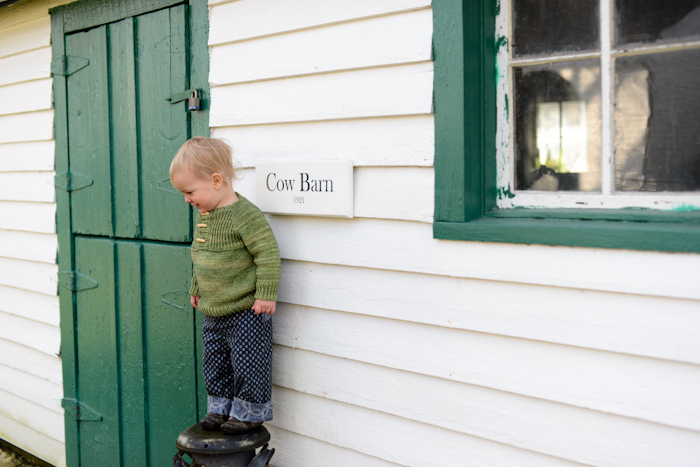 I’m always hunting for cute little boy sweater patterns. Thanks for posting about that gorgeous sweater. After seeing it, I put the pattern (Kinsale) in my Ravelry queue. Not sure which little kid in my life will receive it, but I’ll find someone! And thanks for introducing me to the yarn. I’ve not seen it before but would like to try it. Love the sweater and the color you chose for it. Way to hang in there with it. I’ve made at least a dozen of those pants over the last few years and I love that pattern. So fun! 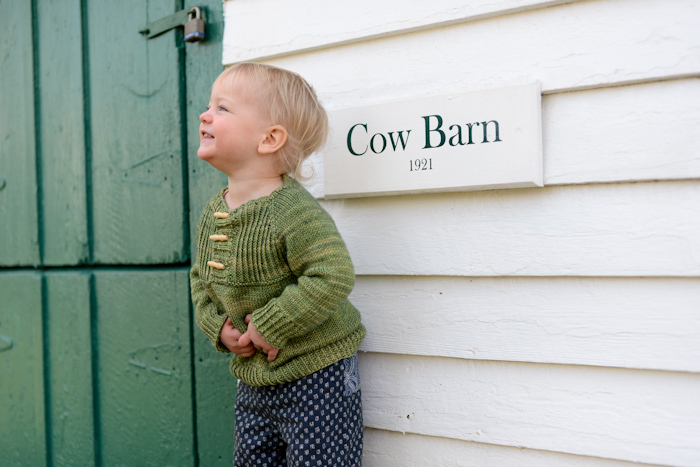 wonderful little sweater…one of the cutest little boy sweaters I’ve seen a while!!! 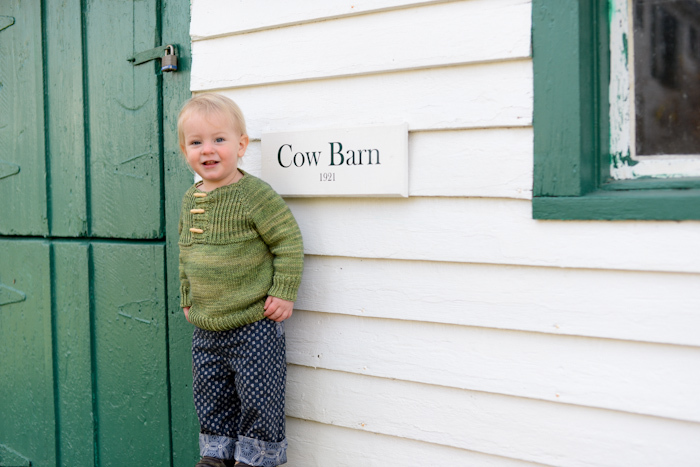 That is one seriously beautiful sweater – and also one seriously beautiful little boy! Thanks for sharing both. Such a handsome little man in his new sweater. I love the pattern and the color too, and it matches those wonderful pants so well! It really is a beautiful boy sweater. You are very right that there are not as many good patterns out there for boys. Love the green color, too. Your blog is wonderful. It’s really so cute…but he’s cuter! What a sweet pattern. Between this and the Sunday Sweater pattern (which is exactly what I’ve been looking for for months) I’ll be kept busy for the rest of the winter. Thank you for sharing. Your pictures are so lovely too. the sweater is adorable! I love the toggles! Did you make those pants too? I love them! They look like the perfect cloth diaper pants. And I’m looking for the perfect CD pants for my daughter. Happy New Year to you and yours! Yes, I made them! 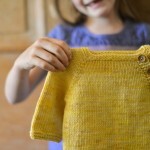 I added a link to the book with the pattern (Handmade Beginnings) at the end of the post. Wishing you a happy New Year Ginny. I love the way the sweater turned out and I love Silas’ smiles! What a cutie. I really like that pattern, another one to add to my Ravelry queue. Bracken would love a sweater like that. Beautiful sweater. The color and buttons are both great! Did you make the pants too? they look like AMH quick change trousers, and I remember another pair you made. Yes, they are quick change trousers! 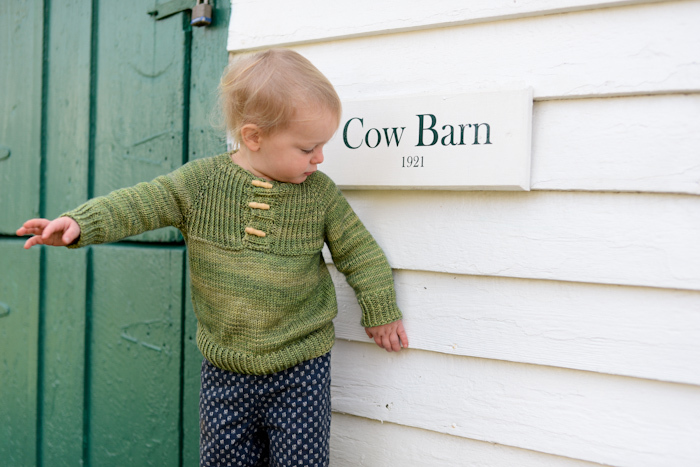 This little green sweater is adorable, and the perfect green, in my book. But I must say, that little fella wearing it is just about the cutest thing ever. I’m sorry to hear you had so much trouble with knitting the sweater, but from seeing your pictures it was totally worth it…not only is the sweater great, your Silas is just so adorable! Those toggle buttons really make the sweater. For all the angst, it’s still a great job…looks like he loves it! Oh.. I have to ask.. what is the story behind the girls and their matching dresses and wings? I’ve seen a few photos pop up of them and I have been meaning to ask! My mom sent the wings to them for Christmas, and they just happened to match the dressed I bought them for Christmas Mass. We let them wear them for pictures before the service, but they had to leave them in the car when we got to church! It’s beautiful! I wish I had your skills. 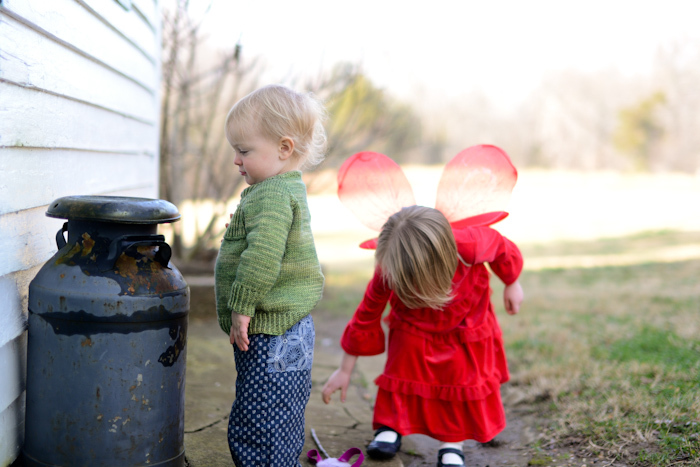 Silas is adorable, and my youngest girl has that same red twirly dress! It’s beautiful! I’m glad it all turned out in the end. It is gorgeous, and Silas is just too cute!!! Sorry about all the ripping out, not fun!! !